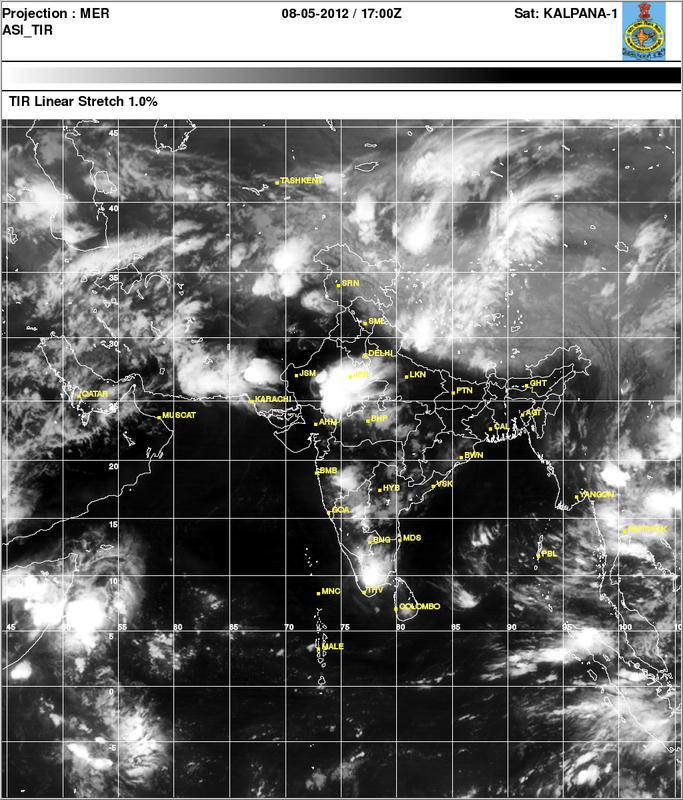 Satellite Image of 8th May (Night) almost coincides with the forecast map put up earlier. A Western disturbance, M-1, now covering Northern regions of India and Pakistan is expected to linger on till Friday. 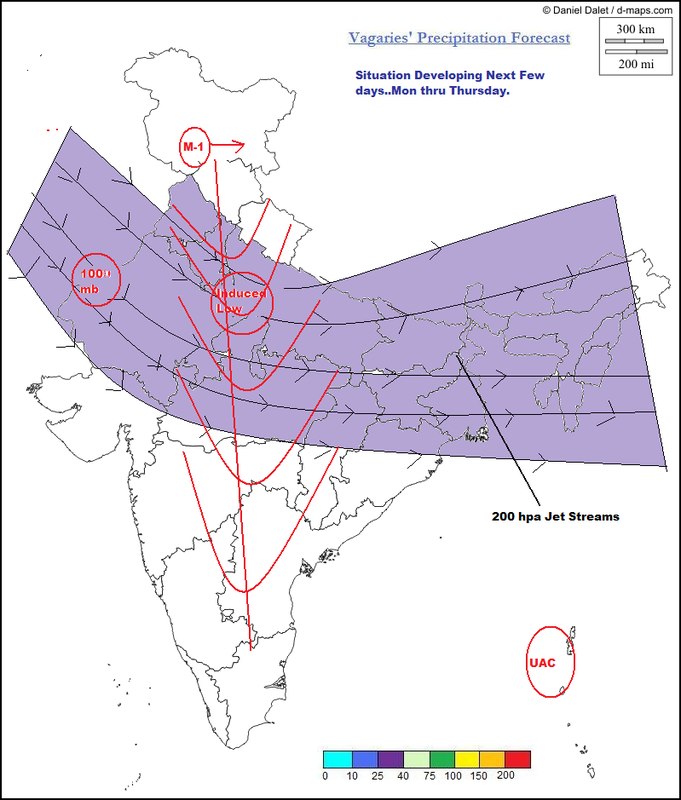 Northern Pakistan, and Northern Indian regions will continue to get pockets of Thundershowers spread out widely from North Pakistan thru Northern Indian states of Punjab,Haryana, Delhi, West U.P. and Northern M.P. Nepal too would recieve showers Tuesday thru Thursday. 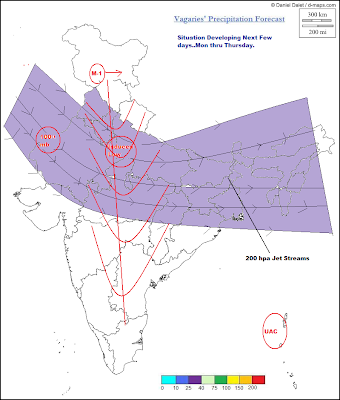 Interestingly, an induced low, basically an off shoot of M-1, will form on Monday and bring rainfall in many regions of Rajasthan, MP, Interior Maharashtra from Tuesday thru Friday. Thunder Squalls with gusty winds likely in Vid, Chattisgarh, and adjoining MP. This is a result of the Easterly 200 hpa jet streams stooping down far to the South. Pune and Mahableshwar gets thundershowers of light intensity on Wed or Thursday. Also, a trough, a line of dis-continuity, will run from this low down to Karnataka/Kerala. Result: Thundershowers in interior Mah, Karnataka and kerala and adjoining TN. Rains may spill over in adjoining AP too. What regions remains dry? Parts of W.Bengal, Gujarat and Konkan! And lower Sindh in Pakistan. Karachi will see some easing of temperatures , from the sizzling 42c it has been experiancing. While Sukkur will see the rise in day temperatures. Maybe some cloudy weather for Monday thru Wednesday. Some regions of upper Sindh may get thundersqualls too. Mohenjodaro (Pakistan) highest at 44c, but... minimum there dips to 17c ! Bangalore mind-boggling population, traffic, zero infrastructure is towards grave calamity. City has no water. Infact I have noticed for last 10years - city has become dusty, barren, state government has removed few of the remaining heritage trees, all lakes drained - properties have come up. Even last 10years rains are erratic. Yearly normal rain of only 800mm, sometimes it rains only 400mm or 500mm. Even NE monsoons are of negligible value. City hardly receives rains from june - sept, bulk of the rain is during pre-monsoon, which this year is absolutely zero. Add to all this driest place Rayalseema (I feel this is more drier than Kutch - which in last 5years is enjoyinh rains) is extending into Bangalore. Mumbai is the only City which has tap water connection to residential areas. Lake fresh drinking water is supplied twice in a day. Compare to south Hyderabad drinking water comes only once in 15days!! Bangalore once in 10day!! Sometimes people have to sleep near borewells!!! Any comments from weathermen of Bangalore (why BBMP,BDA are have no concern for environment???) Infact we from IT group made many efforts for bangalore tree plantation - but all failed. It is extreme pain to see trees cut. @sset,,, th epeople of west coast r very lucky to receive such bountiful rains!! !but the coast south of cochin is showing a negative trend !! !i have noticed one thing ,,,wen the imd has updated climatological data now they r taking 1970-2000,,i foung significant decrese in amount of rainfall nd rainy days also!! !this year bangalore hasnt receeivd its famed mango showers ,,it was as if the boundary of arid rayalseema has intruded into bangalore,while place to west nd north have received decent rain like mysore and chitradurg areas! !i hope the south west monsoon brings sum decent rain to bangalore(a city famed for its pleasant weather nd not for the unruly 37 c nd high minimums wich the city has experienced ths summer!!! Rajesh, do we have any website from which I can download Mumbai's day wise max, min temperatures for a given month ? emkay: will this site do ? junaid/sset: I too hope Karnataka gets some decent rainfall this year..though i think june is poor in some parts. Thanks Rajesh, perfectly suits my requirement. Your site is giving very good information about water, It is very useful in our dailylife, Now a days due to lack of sufficient water so many persons are facing many problems. In this circumstances Borewells in Hyderabad is doing some help to dig and get water. Some of the Borewells in Hyderabad.